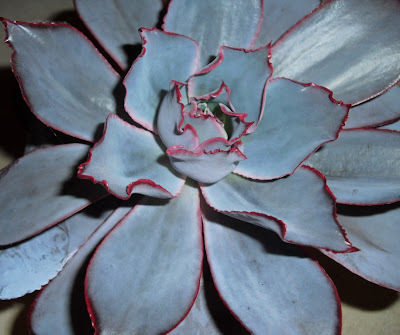 I love Echeverias, but for a long time they were the bane of my existence, succulent-wise. They would do nicely outdoors in the summer, then etiolate horribly during the winter, turning into pale, stretched, misshapen messes. Then I discovered that they will do pretty well under fluorescent lights, especially if kept as close as possible to the tubes, and in a cool room. These three beauties have been going along happily in my basement all winter. If anything, their cool shades of pink-blue-lavender seem enhanced by the slight chill. 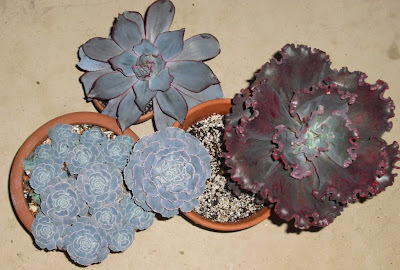 Three Echeveria varieties. Unfortunately, I don't have IDs for any of them. The one at the top might be Echeveria 'Afterglow,' but I am far from certain. I can't seem to get a close-up that does this one justice. The edges of the leaves are pinker in person. I love this plant--it is like a bouquet in a bowl. --it is far less purple in the summer. 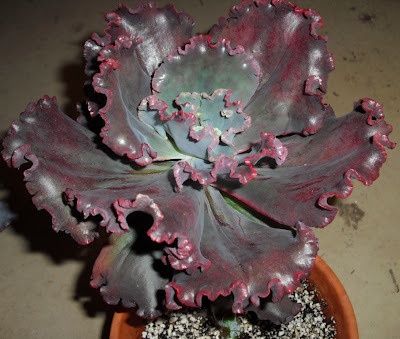 I have other Echeveria species, including a couple that are getting ready to bloom, and a few that I actually know the names of. (Imagine that!) I will be writing about them in the near future. 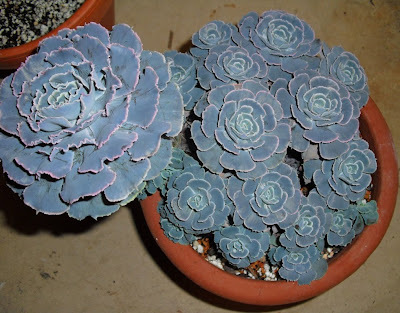 Your echeverias are great! The ruffled ones are my favorite.